I apologize for being so MIA since last week. 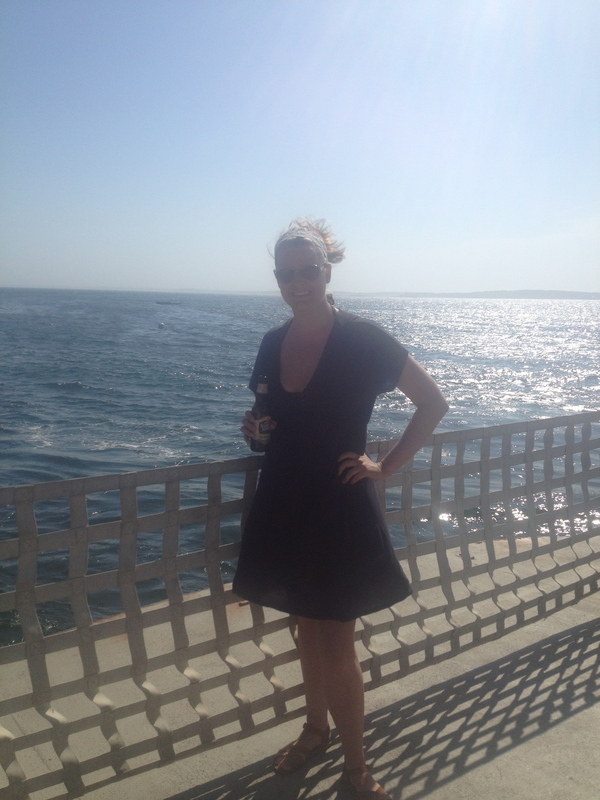 I decided to take advantage of the weather and squeeze in some beach days and visit my sister in Maine. And one of the best things about southern Maine? Amazing food! We ate our way around Portland and Ocean Park and I enjoyed every bite. My biggest challenge, however, was sticking within my WW points. Usually when I travel, I give myself a “by” and don’t track but my weight has creeped up enough that I needed to get back on the wagon. I enjoyed myself but used all my extra points (all 49 plus some activity points) in order to do so. Here’s a quick look at some of the places we visited! My first night in town, I had to go to Huot’s which is a few miles south of our beach house in Ocean Park. We have been coming to Huot’s since I was a baby (and before) and are good friends with the owners. The restaurant is in Camp Ellis and I have numerous memories of walking out on the jetty before, during and after every visit! 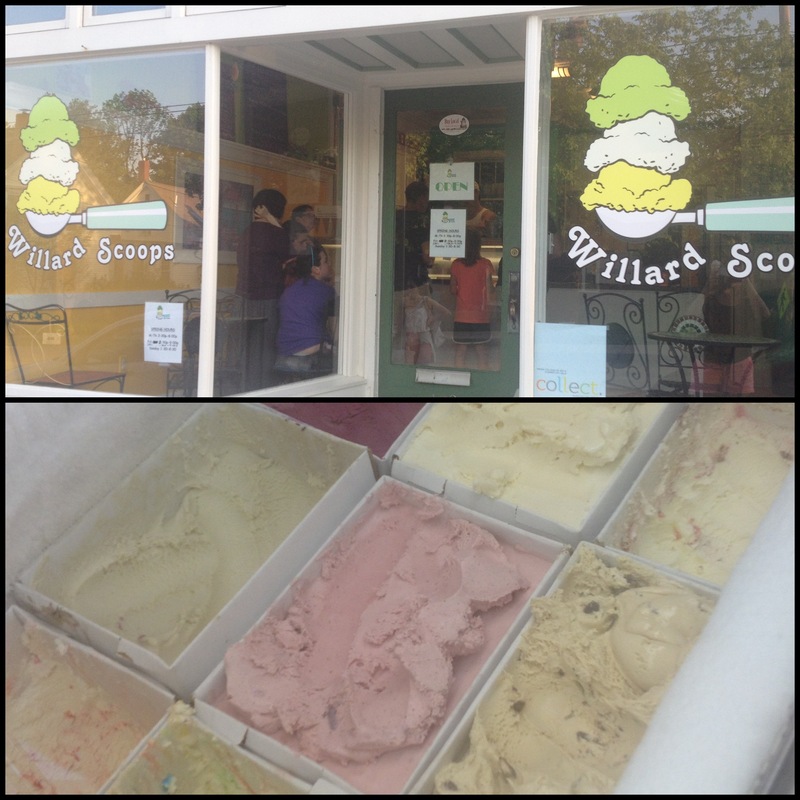 The next stop was Willard Scoops in Willard Beach, South Portland. This was my first trip here but it has become one of Hannah’s favorites since she moved to Portland full time. Saturday was another day the beach so Hannah and I opted for lunch at the Ocean Park Deli. Our house is on the edge of town so the “downtown” is a 5 minute walk away (OP is wicked small!). The “downtown” consists of the deli, the library, one sit-down, BYOB restaurant, a gift shop, an antique shop and the Soda Fountain. We grabbed salads and sandwiches and spent another hour or two on the beach. Hannah had to work Saturday night so I dropped her off at 2:45 before heading into Portland for a snack to hold me over until dinner. Every time I am in town, I have to go to Flatbread Pizza whether it’s to enjoy one of their organic, brick oven pizzas or just their organic salad. The Flatbread salad is something I dream about while I’m away. 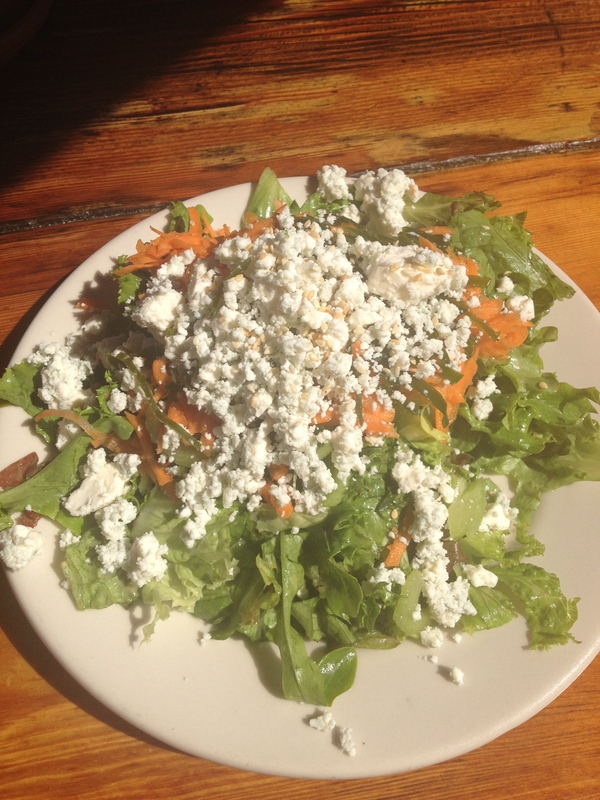 It consists of a bed of organic greens, shredded carrots, seaweed and sesame seeds with a housemade vinaigrette. I almost always add some blue cheese because it’s so creamy and spicy! My roommate, Elly, moved to Portland on Saturday for the summer and she invited me out to dinner. I figured I would go because Hannah was working and I would have some company! Her parents treated me to an unforgettable meal at 555 on Congress St. I had a house salad made with all local greens and produce and the pepper-crusted sea scallops with whipped fennel potatoes and veggies. I was able to meet her parents, her aunt, uncle and cousin. After Elly said goodbye to her family, we headed over to South Portland to visit Hannah at work. We sat on the deck at the Saltwater Grille and had a cocktail while she finished up her shift. Check out that view! Once Hannah finished her shift, we dropped Elly off and headed over to Eventide for a drink and a snack (poor Hannah hadn’t eaten in hours!). 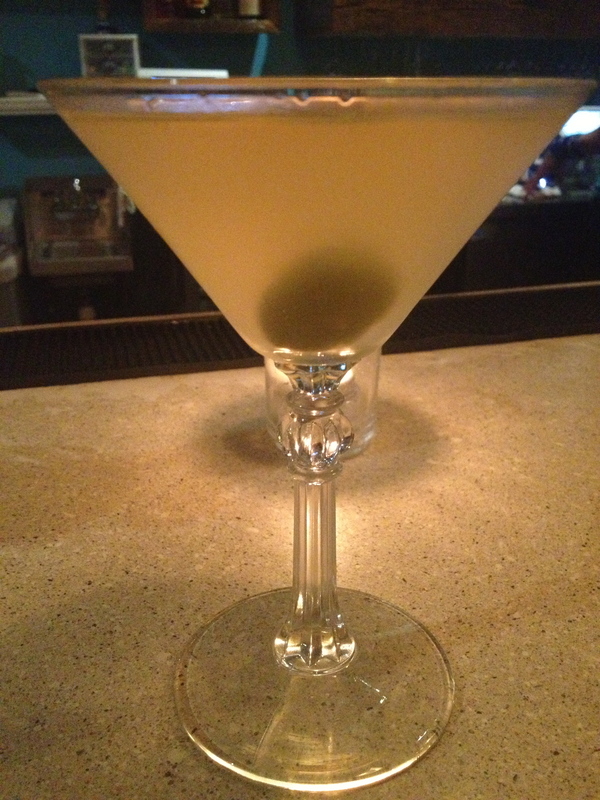 I went for the Dirty, Dirty Martini made with Beefeater gin, olive brine, oyster brine and hot sauce. It was super salty and spicy and so delicious!! Sunday was yet another beautiful beach day so we were back in Ocean Park. Our friend Lynn (more like a sister) came up from Massachusetts for the day so it was great to catch up after almost a year. It was my last lunch in Maine so Hannah and I went to Bayley’s in Pine Point for a lobster roll. At Bayley’s you can choose if you’d like your bun toasted or not toasted and if you’d like it tossed in butter or mayo. I’m a Maine lobster roll kind of girl so I went for the mayo (but light! )- you all remember my Sunday Funday post about Red Hook Lobster Pound, right? 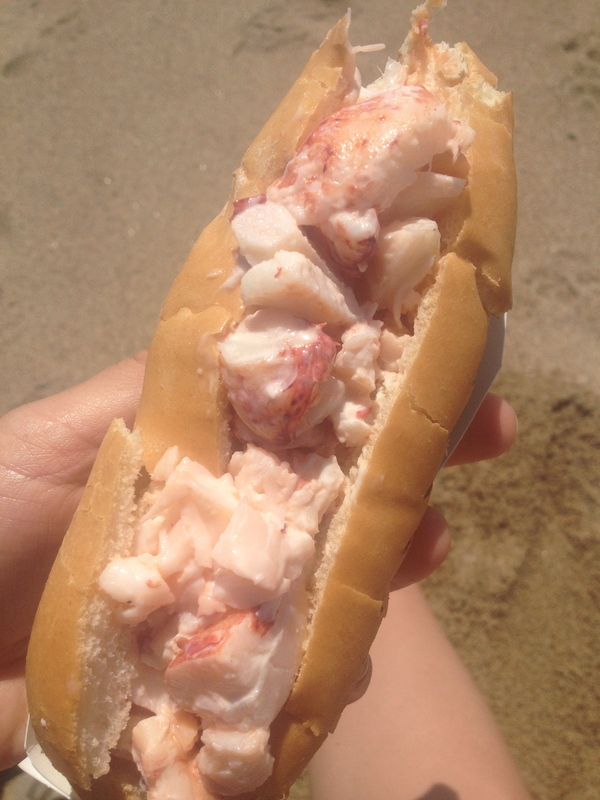 The Bayley’s lobster roll is simple and lets the lobster meat shine through- the perfect treat on a summer day in Maine. Hannah had to work again, so Lynn and I went into Portland and did the mailboat cruise around Casco Bay. 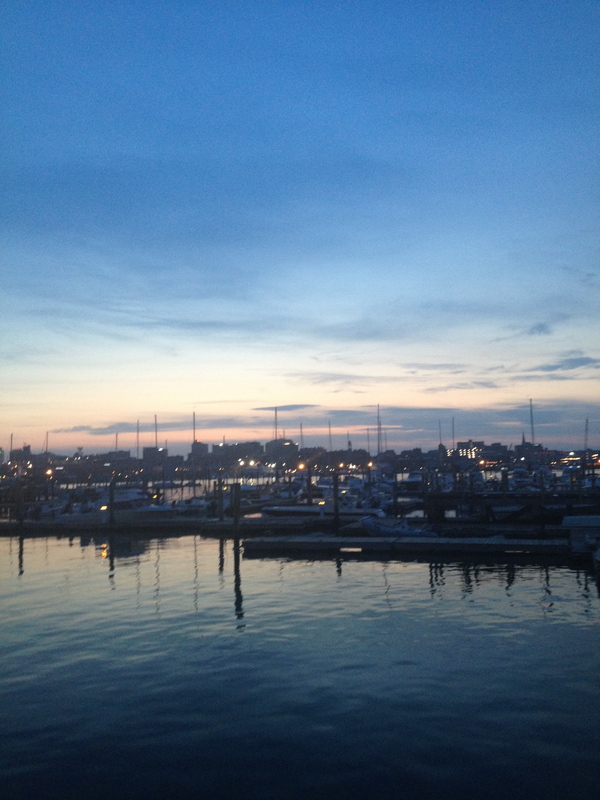 For all the years I’ve been going to Maine (which is my whole life), I have never been on Casco Bay. The mailboat is a 3 hour cruise that stops on 5 islands in the bay dropping off mail and people. The best part- besides being on the water, in the sun and with a great friend- is that it’s BYOB. That’s right, you can bring booze and drink on the boat! We picked up a 6-pack of Sam Adams Summer Ale and spent a glorious (but windy) 3 hours on the water! For my last meal, Hannah and I went to OTTO Pizza to grab some take out. Rain rolled in Sunday night so we decided to grab some pizza to go and settle in at her house to watch some Sunday night TV. We got one of Hannah’s favorite pizzas- sweet potato, ricotta and dried cranberries. I was hesitant at first but, OMG, it was heavenly! Creamy, sweet, tart but somehow savory. It confused my palate, which is hard to do. It was the perfect finale to a perfect weekend in Maine! This was how I had breakfast this morning! 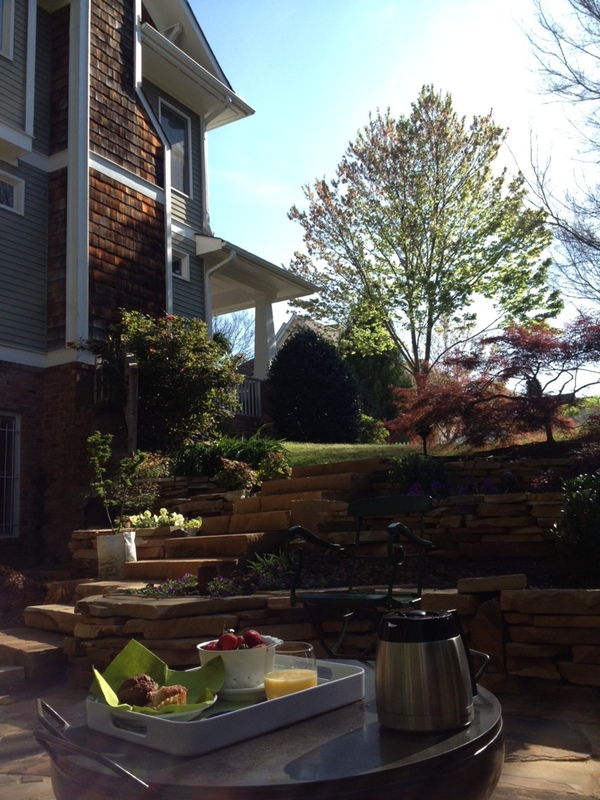 My mom, dad and I sat in their backyard and had coffee, orange/cranberry muffins and OJ. Such a great way to start the day!